How do bears stock up on berries this fall season for their hibernation? 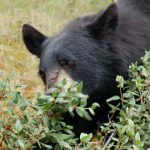 KBCS’s Yuko Kodama spoke with Ed Dominguez, Seward Park Audubon Center Lead Naturalist, to discuss why bears eat lots of berries to stock up on energy reserves, in order to make it through the winter season. They also discuss some of our local black bears’ favorite berries.